In summer, the fur is yellowish-brown to grayish-brown above with a blackish rump and a blackish line down the back from the neck to the rump. The nape of the neck is the same color as the back. The underparts are white. The outer tip of each ear is black. The tail is dark above, white below. In winter the fur is white or pale gray except for dark eyerings and the black tip of each ear. The rear feet are large. The soles of the feet are densely furred. It is active mostly from dusk through dawn, but also on cloudy days. It is mostly solitary excepot when populations are high. 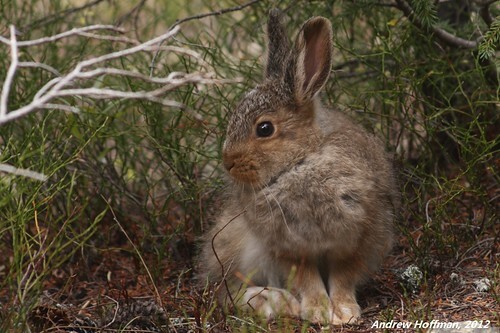 Minnesota varying hare (Lepus americanus phaeonotus) is found throughout northern Minnesota. 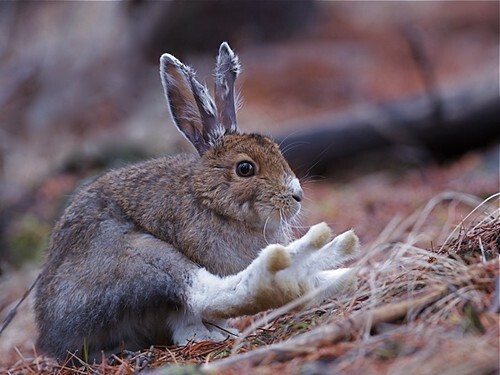 Varying hare (Lepus americanus americanus) may be found in the forested parts of northeastern Minnesota. varying hare (Lepus americanus americanus) ? 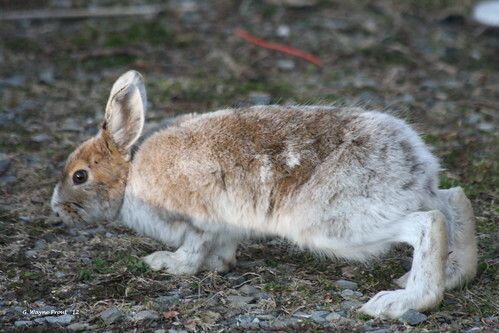 Snowshoe Hare feeding on calcium along the highway near Forteau, Labrador on 2014-04-13. Snowshoe hare eating a apple in the bear's rock den at the North American Bear Center in Ely, MN on 6/17/12.